This page contains a single entry posted on 29 August 2007 07:38 AM. The PREVIOUS post in this blog is titled > Goodbye Tears + The Bug Drinks from a Water Fountain. The NEXT post in this blog is titled > Hasta la Vista, Baby. CSS Mastery ranks about #2,000 of all books sold at Amazon (*millions*), fluctuating between #1,000 & 3,000, depending when you look. In other words, it continues to post strong sales. Another book that also stood out (with a similarly-strong sales-rank) » CSS: The Definitive Guide, by Eric Meyer. With more than 500 pages, it has double the page-count of Andy's book, tho only 15 customer reviews (10 of which received a perfect 5-star rating). In reality, *any* of these books are likely to be excellent, especially considering there are so many to choose from. But if I'm going to spend time reading (studying) a book, I want to make sure my time is well-spent. The treatment of CSS in my current book is little more than introductory. CSS is how you make the cool stuff happen. At 250 pages, CSS Mastery should be a breeze, seeing that the Head First book weighs in at over 650. PS - Somebody should remind me to enroll in Amazon's associate program, so I can earn some ca$h from recommending these books. 1. 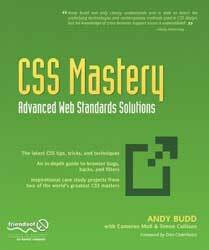 CSS Mastery was published Feb 2006, well before IE7 was released (October 2006). Since IE7 treats CSS differently than IE6, and has become so popular, it would be better to get a book that is "IE7-aware". 2. CSS Mastery is more advanced than I thought. I was looking for a book that would give me a solid foundation of the basics, so I'd be in a better position to learn the advanced stuff later. Note: Eric Meyer's book (mentioned above) is both IE7-aware and purported to give the reader a solid foundation in the basics. So that might be a more appropriate starting point. Or even the "from Novice to Pro" book. People such as Cederholm are updating their books to reflect changes associated with IE7. I have heard lots of good things about Dan's book too, but it is also more for the "advanced CSS" reader. There are actually a few books I would recommend for what you are looking for. One that was recently released in its second edition » Bulletproof Web Design by Dan Cederholm. The second edition is updated for IE7, but the entire book focuses on building bulletproof layouts that work cross browser/platform. Another book is Simon Collison's book, 'Beginning CSS Web Development'. Again, this book covers some of the basics - but also talks about managing your browser hacks accordingly. Most of the managing is actually building so you don't need to use hacks - which is the best solution. CSS Mastery is an excellent book, and is still definitely relative to what is going on in the web today. The methods and techniques used in that book are all still relevant. Some of the book may seem a bit advanced, but it sounds like you are moving through the basics and looking to get some more foundation. Lastly, you might want to look at 'The Art and Science of CSS'. This book would be the last to check out, simply because you are looking more to learn the foundation. This book is more of a 'cookbook' that gives you guidance on styling specific aspects of a website. Even though it doesn't teach foundations, much can be learned from this book as well. 1. Bulletproof Web Design, 2nd ed. All are excellent books for your library, and once you read through some of those you might want to consider 'Pro CSS Techniques'. I think this path would help you the most, I know it did for me. Let me know if you have any other questions and I will try and help wherever I can! This is the strategy I'll take. Research is cool, but there's no substitute for first-hand knowledge. Now if only Andy Budd, like Dan Cederholm, would also update CSS Mastery to reflect changes associated with Internet Explorer 7.